Contents of: What is FERPA? 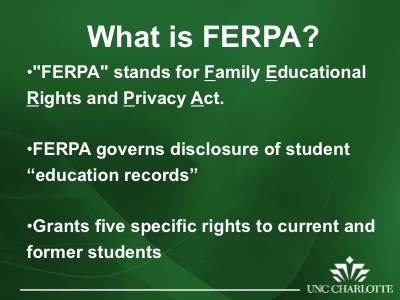 “FERPA” stands for Family Educational Rights and Privacy Act. Grants five specific rights to current and former students. The right to file a complaint with the U.S. Department of Education in Washington concerning an alleged failure by the University to comply with FERPA. Contents of: Who is covered by FERPA? 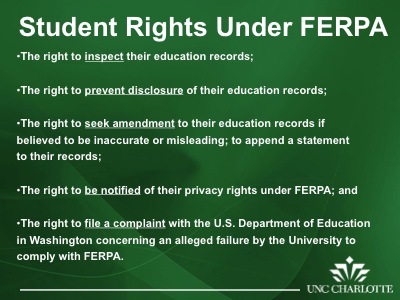 UNC Charlotte’s FERPA obligations extend to living students currently attending or who have attended at any time in the past, and only to information collected about them while they were attending (or information gathered post-attendance that is directly related to the students’ attendance). NC Public Records Act treats records of applicants (whether admitted or not) as confidential; FERPA does NOT require this.